Save the Date — Sunday, April 30 EVNJ Meetup at Rickey Farm in Vernon. Sign up and RSVP at our Meetup site. Want to become more involved? Please update your information here. We have more than 600 subscribers on our mailing list, including folks interested in rural, urban, and town/suburban ecovillage locations. We’ve worked through a lot of issues, partnered with the Ecovillagers Alliance, put in an offer on a property, and organized educational monthly events for more than two years — with a several dozen people attending each event. Now, we’re asking you to join us in making this dream a reality. Become a decision-making MEMBER-OWNER by contributing $10 a month and at least an hour a week. We’re organizing into Functional and Location Action Circles. Functionally, we have three broad areas: People (communications, membership, etc. ), Place (site selection, building, etc. ), and Prosperity (finance, budgeting, fundraising, etc.). With regard to location, we have Urban, Rural, Town, and Suburban groups. You can choose your preferences when you update your profile. PLUS: You’ll be able to attend meetings in person, or participate via Zoom video-conferencing. That’s right, if meetings are too far away, or if you want to reduce your carbon footprint, join us from your computer or smartphone. We’ll send out meeting invitations to those who sign up under functional or location groups. The invitations will include both the physical addresses for in-person attendance, and Zoom web addresses and conference phone numbers for virtual attendance. The first task of our project, Ecovillage New Jersey, was to spread the word, to reach out to as many people around the state as possible to let them know that there is an active project underway. The response has been great. Hundreds have attended our Meetups. Probably thousands of people have heard about our efforts. Now we want to start to turn interest into commitment and move to an organizing model where we more directly address that crucial issue: where will the resources come from? The needed resources are money, professional help and volunteer help. Let’s focus now on number 5, the idea of a contributing membership base. Going forward, we’re going to move toward becoming a dues-paying Meetup.There are over four hundred people on our Meetup list and hundreds more on our email list. We intend to find ways to stay in touch with them all and we’ll hold special events where all are invited — but our monthly meetings will become working organizing meetings where attendance will be predicated upon a commitment of money and/or time — hopefully both. We need a lot of the people who are interested in our project to become actively participating and contributing Members. There are Meetups where attendance requires advance payment. We don’t want to do it that way because we want to enable newly interested people to experience a couple of meetings before being required to make a commitment. And we want to be amenable to those who say they can commit extra volunteer time in lieu of money. Ideally we’d like to have Members give $10 and four hours of work per month. That’s just an hour a week of work. The money can be paid in any increments… $10 per month or $30 per quarter or $60 twice a year. But the transition we’re making is to start to keep track of who’s a recognized Member able to attend on a regular basis, able to have a vote in all decision-making, and able to participate on a working committee (what sociocracy calls a functional circle). So: please help hasten the day when all those who are interested will have multiple community-living options in our state. Make a commitment to get active and become a contributing Member of the Ecovillage New Jersey project. Consider the issue of childcare. Given the high cost of living these days, most couples need to have two full incomes. So the typical pattern of young family life now is: one or both parents can enjoy two or three months at home with a new baby and then they have to go back to work… turning the care of the baby over to a daycare provider for most of the week. Even if a couple could afford to have one of the parents stay home full-time, these days it’s not always felt to be a desirable option. People base self-esteem on their participation in the workforce. And they value their social life. Caring for a baby alone in the isolation of the nuclear family can be pretty lonely. A few generations ago, when most people lived simpler lives in a town or village type of setting of some kind, the norm was for mothers to raise their young children together. There were many benefits to doing it that way — help, support, sociality, people learning from each other, filling in for each other when needed. A village setting can have built-in childcare that’s communitarian in nature, not institutional — and at very little expense. Our movement resonates based on ideas about cooperation, sharing, ecological responsibility, etc. But we’re getting at something deeper than just that. We’re actually counterposing two ways of living. The current ways are institution-based. We mostly buy what we need from corporate institutions. Most of us work for institutions of varying kinds. There are big governmental institutions, commercial institutions, educational institutions, religious institutions, etc. Meanwhile, for our intimate care and sustenance and solace… the primary support system has been reduced to the small and often isolated nuclear family. That puts a lot of stress on the nuclear family. It’s not surprising that we’re starting to see a breakdown of that paradigm. To thrive, people need broader support systems. People used to have extended family living nearby. With all the modern hyper-mobility that’s not the norm anymore. It used to be that the nuclear family was embedded within two other circles of support: extended family and then familiar community members. People were interdependent within those three circles of support. Consider that there are two levels of social change activity. They’re both important. At the macro level we do need to work for broad, society-wide solutions and improvements — and a good example is paid family leave. In the last election Bernie Sanders and Jill Stein pointed out how the norm in many European countries is much more supportive of families… in some cases up to a year of paid family leave. Those kinds of macro-level reforms are often given the highest priority. 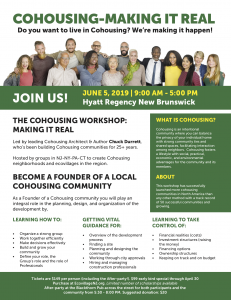 But just as important are the kinds of changes we can effectuate at the micro level, the local level… where we need to be re-creating or rejuvenating or regenerating community life. Ecovillages and cohousing communities are models for that kind of change. It’s not as if everyone could or should live in a special kind of a place like an ecovillage, but our task is to model better lifeways, alternative ways that can emulated. As we present these ideas, we know that lots of people nod their heads in agreement. The ideas resonate. 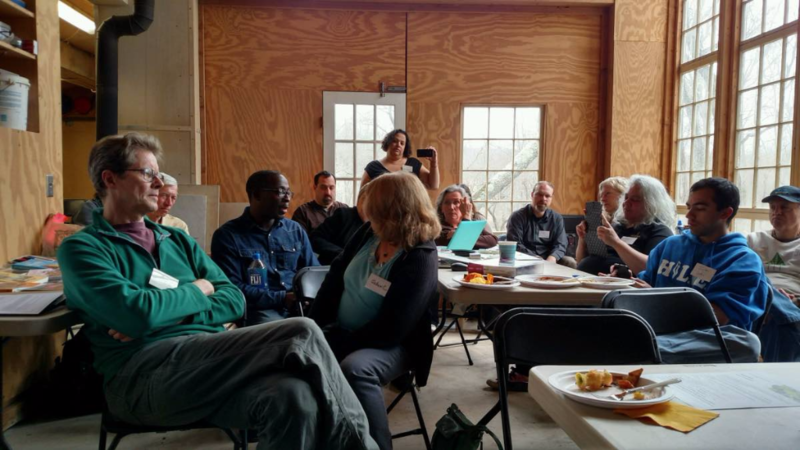 So why aren’t there a dozen ecovillages and cohousing communities in New Jersey? The answer, of course, is that it’s a very challenging endeavor. Creating an ecovillage or transforming an existing neighborhood requires a lot of resources of many kinds. This entry was posted in Agendas, Cooperatives, Ecovillage, Education, Empowerment, Events, Minutes. Bookmark the permalink.